Do you know awesome faculty, administrators, and staff—the ones who are a testament to the important work done on your campus every day? Don’t miss this opportunity to show your appreciation for their dedication and contributions by submitting their names for the NISOD Excellence Awards! The NISOD Excellence Awards were established in 1991 to provide NISOD-member colleges with an opportunity to recognize individuals doing extraordinary work on their campuses. 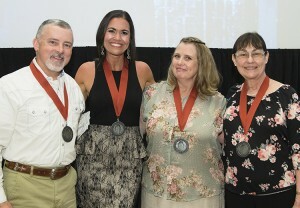 Since then, more than 25,000 recipients have been honored with the Award by their colleges. Each May, during NISOD’s International Conference on Teaching and Leadership Excellence, recipients are celebrated during an elegant and inspiring gathering that recognizes their contributions and achievements. NISOD membership provides an opportunity for HACC to recognize our employees who demonstrate excellence in and out of the classroom. In addition, HACC employees feel honored to be selected by their peers to receive the prestigious NISOD Excellence Award. All submissions must be coordinated by the NISOD liaison and approved by the college CEO prior to submission. To find your liaison, click here. Click here to read about the wonderful and numerous ways NISOD Excellence Awards recipients are celebrated. Please contact Beth Helberg for additional information.